The frontispiece of Cave Beck’s Universal Character, showing the figures of Europe, Asia, Africa and America. They greet each other with ‘dumb Signes’ and, predictably enough, elect Europe as their ‘Speaker’. Catalogue no.44. Among those who sent their ideas for a universal character to John Wilkins during the 1650s was the Ipswich schoolmaster, Cave Beck (1623–1706). Beck’s work, which was disparaged by Dalgarno as ‘nothing else, but an enigmatical way of writing the English language’ (Letter to Hartlib, 20th April 1657, British Library, Ms. Add. 4377, fol. 148r), aimed to facilitate communication by providing a largely numerical character which could be read off in any language. It contained little grammatical analysis, and was never equipped with the philosophical dictionary which Beck envisaged (along the lines of Comenius’s Janua linguarum, see catalogue no. 39). Instead, the characters were keyed to a simple list of 3,996 primitive English words. The meaning of these roots could be modified to produce a variety of derived nouns and their cases by the addition of coded letters to the basic number of the root. Beck also suggested a primitive system by which the letters and numbers could be vocalized. Beck hoped that his work would promote trade, and make the work of converting native peoples to Christianity easier. He saw its principal advantage as being its simplicity, and the supposed ease with which it could be learned. Many of the laudatory poems prefixed to Beck’s work mention the curse of Babel, and hope, rather optimistically, that the universal character might overcome the confusion of tongues. The verses, by ‘E.K.’, which accompany the frontispiece urge the peoples of the world to unite under Europe’s direction and agree to build Sion, in place of Babel. 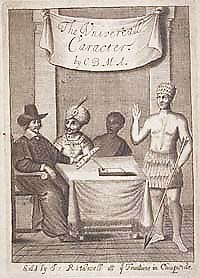 The frontispiece itself shows figures representing Africa, America, Asia and Europe grouped around a table. According to E.K.’s verses, they greet each other with ‘dumb Signes’, and elect Europe as ‘Speaker’. Europe holds a piece of paper on which are written the numbers ‘2356’. These translate as ‘to hunt’ in Beck’s character, which might be a (somewhat ominous) reference to Nimrod, the builder of Babel and ‘a mighty hunter before the Lord’ (Genesis 10:9), but is perhaps more likely to be an engraver’s error! Vivian Salmon, The Study of Language in 17th-Century England (2nd edition, Amsterdam, 1988), pp. 176–90; Vivian Salmon, The Works of Francis Lodwick (London, 1972), pp.18–19&131; M.M. Slaughter, Universal Languages and Scientific Taxonomy in the Seventeenth Century (Cambridge, 1982), pp.120–1; British Library, Ms. Add. 4377 (Papers of John Pell).